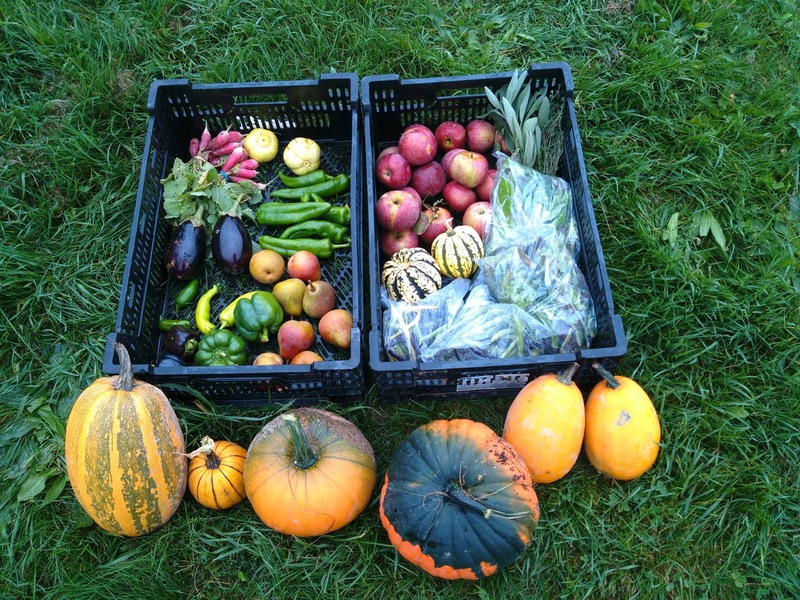 We've been enjoying lovely fall weather, which has let us continue to enjoy all the bounty of the garden and orchard. This week we have a lot of new items, apples and pears from the orchard, acorn squash and pumpkins, and the mixings for a fall salad with mixed greens, radish, and the last of our cucumbers. Hopefully the weather will hold for another week or two. We have more apples in the orchard, and Brussel sprouts, parsnips, and celery to come! Large Share Pictured: 2 jac-0-lantern pumpkins, 2 pumpkin pie pumpkins, 2 decorative squash, 2 eggplant, 2 lemon cucumbers, 2 bunches radish, 6 anaheim peppers, 2 hungarian peppers, 2 jalapeno peppers, 4 bell peppers, 6 pears, 16 apples, 2 acorn squash, 2 lbs green beans, 1 lb mixed greens, 2 bunches herbs. Just in time for October, we have jac-o-lantern and pumpkin pie pumpkins! We also have some odd small or tall ones for decoration. Back for the fall we have fresh cut greens of romaine, oak leaf, green leaf, red leaf, baby spinach and arugula! Back for the fall we have french breakfast radish, perfect for a fresh salad. We also enjoy these sliced on buttered and toasted sourdough bread. New this week we have pears from our orchard. They are just starting to ripen on the tree, so you may need to give these a few days to ripen. Still hanging in there, we have the last lemon cucumbers of the season! Enjoy these with your fall greens. Enjoy some baked acorn squash for desert on a cold fall evening! Everyone gets an eggplant this week, we enjoy these sliced and grilled with olive oil, salt, pepper, and cumin. This week we have bell peppers, jalapeno, Anaheim, and hugarian wax peppers for everyone. This week we have sage and thyme for everyone.